Can you tell us how you came to be involved in the subsea industry with a short career background prior to Seafloor Systems? I was a Naval Hydrographer and Sonar Technician with an EOD (Explosive Ordnance Disposal) Unit prior to entering into the private sector. My job in the Navy entailed using sidescan sonar to detect and locate undersea mines as well as underwater search and recovery operations. Once I detached from active duty, I was hired by Reson, Inc. in Santa Barbara to support their range of multibeam echosounder systems. I worked for Tony Parker at Reson, who inspired and tutored me to succeed. I owe a great deal of my success to Tony. From there, I worked as Sales and Support Engineer for Triton Technology, Inc. in Watsonville, CA. I worked for a very smart and all around great guy named Fred Newton. Fred is a legend in the underwater search and recovery industry, and I was lucky to get the opportunity to work for him. The experience I gained working for Fred has served me well, and I am very appreciative of his patience and tutelage. Guys like Tony Parker and Fred Newton are two great examples of successful people imparting their experience and wisdom to the next generation, and I was lucky to work for both of them. I try to continue this legacy with the young men and women that I hire to work at Seafloor Systems. 1.) Equipment Rental – We have the largest pool of multibeam echosounders in the United States. 2.) Sales – We represent 25 of the industry’s top equipment manufacturers. 3.) Manufacturing – We manufacture the Sonarmite Echosounder in our Cameron Park, CA facility to Milspec specifications. 4.) Consulting – Our staff of hydrographers provides onsite/offshore training and support on our range of equipment to ensure the success of each and every project. We understand you started Seafloor Systems in 1999. Can you take us back and tell our readers why you started the company, its original focus and how that focus has changed from then to now? I believe in always continuing to look for the next challenge and opportunity to grow professionally and personally, no matter your age or position in life. Leaving Triton and moving to Oregon was hard, but my wife and I were in a good financial position and the industry was in an upward cycle. The timing was perfect. 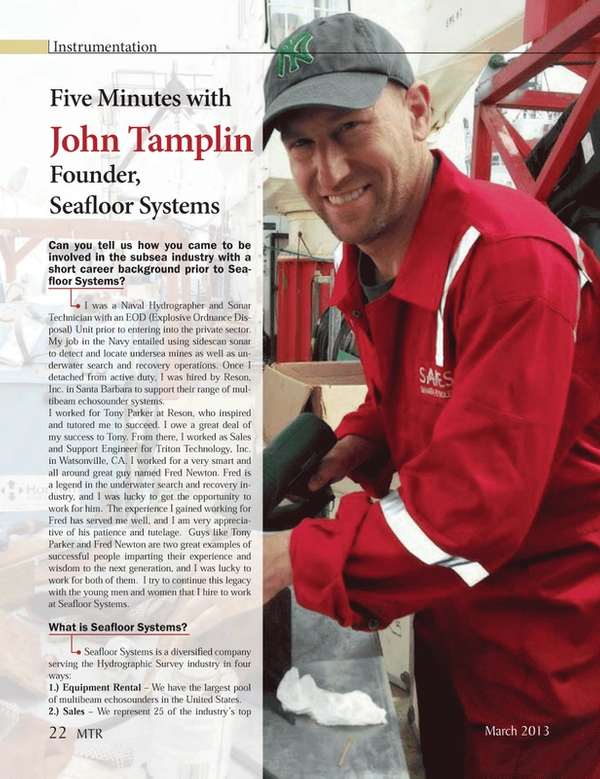 I originally started Seafloor Systems as a Manufacturer’s Representative and also provided hydrographic survey field support for equipment that I was most familiar with. The company has evolved into its current form due to the diverse variety of fields I have worked in as well as investing for the future. In this vain, I eventually purchased that first piece of rental equipment, a multibeam echosounder from Honeywell-Elac in Germany, and developed custom survey systems for customers. Since you started Seafloor Systems, what do you find to be the biggest challenge to running a profitable company? Accounts Receivable. Most customers have the good intention of paying, but, sometimes not the fiscal discipline to pay in a timely manner. Collections are equally as important a function as engineering, sales and support when running a business. What do you monitor to help yourself decide the business’ direction? Beyond monitoring all the profit and loss statements, balance sheets, and reports, I like to take advantage of the wisdom and experience others pass onto me. A friend of mine was buying up houses in small towns that didn’t seem like good investments. When I asked him why he specifically chose these towns, his answer surprised me. He said he monitors various large companies (like Home Depot and Wal-Mart) for new store developments. These companies allocate millions of dollars into market research before deciding to build. He was taking advantage of their budget, and it has been very successful. I have kept my ear to the ground regarding new developments by such leading manufacturers such as Hypack, Teledyne and Trimble, of whom I represent. Rarely do industry leaders develop equipment or software on a whim; it’s always based on research and future demand. Looking at the various markets you serve, by type, what are your specialties, and/or where does the majority of your business come from today? Our specialties are by far our Multibeam echosounder rental pool and our Sonarmite echosounder production. These two account for nearly 50% of our revenue. We have the largest pool of rental multibeam systems in the U.S., covering the spectrum of water depths from one to 3,000m. We also keep our lease pool up-to-date and offer proven, bullet-proof technologies. We prefer to leave the beta-testing to the manufacturers, not our customers. Our Sonarmite echosounder is the most compact echosounder system on the market, provides survey grade results, and is bullet-proof. My mantra is to provide a good, quality product and it will sell itself. How have the general economic struggles of the past four years affected your business? We have been lucky in that the diversity of our company offerings; it has enabled us to maintain and grow in several areas over the last four years. How is your company differentiated from others serving the same market? We have a small, but tight-knit, well-trained and smart group of individuals that are all capable of providing service and support in all facets of our business. I take pride in the fact that when a customer calls in for technical support, there is always someone available to provide top-notch assistance. In your career, what do you consider to be the technological development that has had the biggest impact in making the business of subsea more efficient and safe? I believe the technological development would be ROV’s. On a purely efficiency basis, GPS has developed into such a versatile and accurate tool. It is invaluable to the industry whether it’s hydrographic survey and mapping, vessel navigation or mine hunting.